The second Mystery Rummy game. 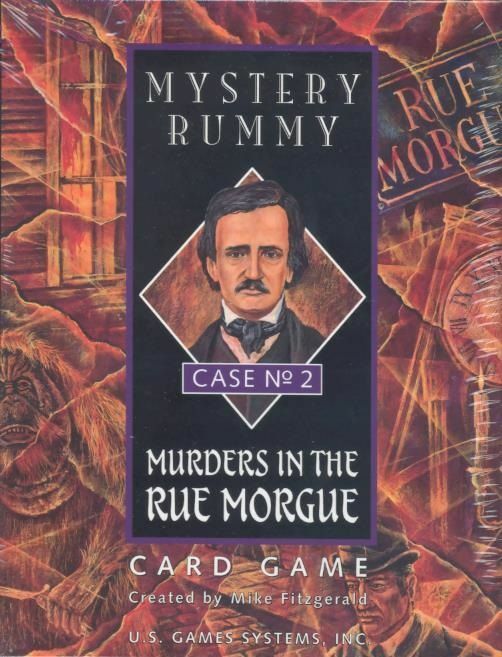 In this one players investigate the murder from the Edgar Allan Poe story. The basic mechanics (evidence card melds, gavel cards, etc.) are similar to the first Mystery Rummy game, but this one adds a hidden "kitty" in which players secretly place cards throughout the hand. The first player to go out (before the draw deck is exhausted) wins the kitty in addition to their regular melds. Can be played as a partnership game with 4 players.